Just how incredibly bizarre, yet pulsatingly exciting, can a quiet fish from a south coast Wellington beach on a hot sunny afternoon become? 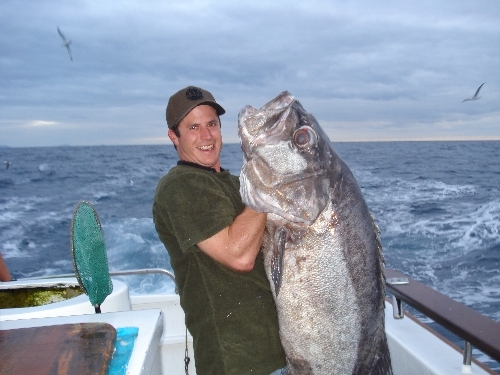 For one Wellington Surfcasting member the chain of events that unfolded can best by the angler himself. “I had just caught a small spotty shark when I noticed a commotion near the water’s edge about 300 metres down the beach. Amongst the huge swirl of water the colour blue was prominent and my first thoughts were of a large blue shark stirring up the bait fish. I continued fishing and about five minutes later was completely gob smacked when a very fast and large bow wave came racing straight towards me, veering off just yards from the shore and giving me a near perfect view of a good sized billfish displaying those incredible “lit-up” blue colours of a fish hunting food. By this stage I was in a fit of excitement that only went up another gear when the billfish repeated his mad shoreward dash a few minutes later. And this for me was the sad part, for the split-second timing of the billfish’s run, coinciding with a good dumping wave, deposited the fish right on the beach and I could only watch in awe as the fish struggled to get back over the lip into the relatively shallow water. It was a forlorn hope even though I thought I could help try and turn its head into the sea, but it just was impossible to move the fish, which I now recognised as a broadbill and guessed its weight at around 180 kilos. I could also see that the fish had snapped one of its pectoral fins as it crashed onto the beach and this helped me make my mind up to humanely put the fish out of its dying struggles. As an aside, I am told the swordfish’s stomach contained numerous hoki, a species occurring in the adjacent deep canyons and reefs of Cook Strait. The conjecture is, why would this particular fish stray so far from its usual haunts and what food was it hunting so close to the shore?